Trek to the ruins of an ancient fort, climb over boulders over 4,000 feet above sea level, scale the largest monolith hill in Asia and go kayaking at the vast Manchinabele reservoir. This action-packed trek to Savandurga takes you across barren mountain hills, with sections of dense greenery, with panoramic views of the landscape. At the top of Savandurga, views of a golden sunrise illuminating the forests and waters Manchinabele await. After exploring the rustic brown beauty of the mountains, you'll go swimming and kayaking at the Manchinabele reservoir to relax and cool down after an adventurous trek. Located at a distance of 60-km/2-hr drive away from Bangalore, Savandurga is Asia's largest monolith hill. The fort was once the location of an ancient fort that served as a prison, but today not much remains of the original structure. The peak of Savandurga, at an impressive altitude of over 4,000 feet, overlooks the Arkavathi River as it feeds into the Manchinabele reservoir. • Trek to Savandurga, the largest monolith hill in Asia. • Explore trails and routes in the Savandurga State Forest. • Catch a beautiful sunrise from the peak of Savandurga. • Go kayaking and swimming at Manchinabele. • Embark on a short, moderate intensity trek near Bangalore. Consumption of alcohol, drugs and tobacco products like cigarettes is strictly prohibited during the trek to Savandurga. Travellers are required to follow instructions of the trek leader during the trek to Savandurga. For cancellations made 24 hrs or more before departure of the Savandurga trek: 90% refund. For cancellations made less than 24 hrs before departure of the Savandurga trek: no refund. You can be picked-up from multiple pick-up points located all across Bangalore. These include: Marathahalli in Kala Mandir by 22:30 hrs, Krishna Bhavan Restaurant in Silk Board by 23:00 hrs, Udupi Garden bus stop in BTM layout by 23:10 hrs, Banashankari bus stop by 23:30 hrs and Gopalan Arcade in RR Nagar by 23:50 hrs. The tour operator reserves the right to alter or cancel the itinerary of the trek to Savandurga to ensure safety of travellers and staff. Additional costs due to such a change in itinerary will be borne by the traveller. The tour operator takes utmost care to ensure safety of the travellers and shall not be held responsible for any mishap or accident while during the trek to Savandurga. Arrive at one of the pick-up points located all across Bangalore and meet your fellow trekkers. Board a private vehicle and settle in for a 5-hr drive to the base of the Savandurga trek. You'll arrive at your destination by 04:00 hrs in the morning. Grab magnificent views of mountains and hills on the trek to Savandurga. After a quick briefing session with your trek leader, you'll begin the trek to Savandurga. Over steep inclines, and rocky meadows, you'll navigate and hike your way for two hours. You'll reach the Savandurga peak, just in time for the sunrise. | After some time spent admiring beautiful views from the top, you'll retrace your steps back to the base. A 30-min drive from the base later, you'll reach the Manchinabele reservoir, where you'll take a dip in the reservoir and go kayaking. After a few hours spent engaging in fun water activities, you'll begin the journey back to Bangalore. Subject to traffic conditions, you'll reach Bangalore by 12:30 hrs. Go kayaking at the Manchinabele reservoir. Arrive at one of the multiple pick-up point and travel to Savandurga base. Since no meals are included in today's package, you'll want to have dinner before reporting to the pick-up point. You'll spend the night in a vehicle. 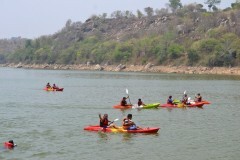 Trek to Savandurga, go kayaking at Manchinabele and travel back to Bangalore. Today's meal package includes breakfast only. Subject to traffic conditions, you should reach Bangalore by 12:30 hrs. The tour operator will arrange your transport the start point of the Savandurga trek.